Losing teeth can be quite distressing. Considerations such as replacement cost, convenience, your health and longevity may cause analysis paralysis, but it is important to replace them as soon as possible so you can eat and talk normally and to restore aesthetics and self-confidence. Your restoration options include both dentures and dental implants, but which one is the best choice for your situation? The following guide is a comparison of the two and will help make your decision a little easier. What are Removable Complete & Partial Dentures? Dentures are removable appliances that replace missing teeth as well as some of the gum tissue. Complete or full dentures replace all the teeth in the upper or lower jaw, or in both jaws, while partial dentures are used to fill in gaps when some of the natural teeth still remain. Complete dentures rest directly on the gums, whereas partial dentures are supported by clasps around existing teeth or with precision attachments that are fitted onto crowns. Dentures have a pink gum colored acrylic base that supports the denture teeth. Some dentures will include a lightweight metal framework for extra strength and support. A dental implant is a titanium post that is inserted into the jawbone, replicating the root of a natural tooth. The implant post osseointegrates or bonds strongly with the jawbone, creating an anchor which is used to hold a replacement tooth. They can be used to replace single or multiple teeth, supporting crowns, bridges and even dentures. What Are the Benefits and Drawbacks of Dentures Compared to Implants? Cost Less expensive, but often less effective Higher up front cost, but better value in the long term. Replacement teeth will look quite natural as modern denture teeth come in many different shapes, sizes and shades. The pink acrylic used to replicate your gum tissue can be closely matched to your natural gum color. Dentures are the more affordable option, particularly if you need to replace multiple teeth. The process for making dentures is non-invasive and unlike implants doesn’t require any surgery. Dentures are easy to adjust and modifications can be made to accommodate further tooth loss. Correctly made dentures will support the cheeks and lips, restoring height between the upper and lower jaws so the face no longer looks as if it has collapsed inwards. They don’t look quite as natural as implants since they display acrylic instead of actual gum tissue. They need to be removed and cleaned regularly, and must be left out of the mouth overnight to give the gums a chance to recover. Dentures can sometimes slip around, particularly if they have been worn for a few years as the jawbone changes shape, becoming flatter and less able to provide retention. Messy and expensive denture adhesives only provide a temporary solution. Some people find it difficult to get used to speaking and eating with dentures and may lack the muscle control required to hold them in place. There are restrictions on the types of foods that can be eaten. These restrictions may make it more difficult to have a balanced diet that provides all the nutrients required for good overall health. Dentures tend to trap food which can increase the risk of gum disease and decay of remaining teeth. Dentures can be quite fragile and are likely to break if dropped. 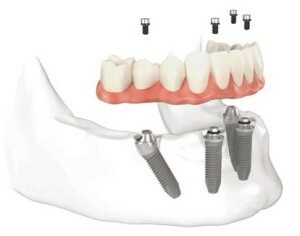 They usually need to be replaced every three to six years (versus 15-20+ years for implants), although those with a metal framework and which are supported by natural teeth may last a little longer. Some people have a psychological aversion to wearing dentures and would prefer not to have removable teeth. Partial dentures can weaken the natural teeth supporting them, and it may be necessary for these teeth to be re-shaped or adapted slightly to accommodate the dentures clasps. Dentures are generally covered by most dental insurance plans, and your insurance may pay between 15% and 50%. Dental implants are often classified as a cosmetic procedure, so the costs aren’t typically covered. It is worth checking with your provider as it is possible your insurance might cover a portion of the implant crown, bridge or denture. Implants that are properly cared for can last for many years, or even for life, so costs can be lower in the longer term. In comparison, dentures will need replacing relatively frequently. Implants help to preserve bone and prevent gum tissue from shrinking by stimulating them with the forces produced by chewing, which reduces your risk of losing more teeth. Dentures do not have this effect, and an ill-fitting restoration can even accelerate bone loss if it places too much pressure on the gums and underlying bone. Dentures need to be cleaned meticulously every day. In comparison, implants can be maintained by simply brushing and flossing. Implants look very natural and function in a way that is similar to your own teeth. Dentures can feel very large and bulky in comparison. Dentures often slip around or may click during eating and speaking whereas implants cannot move and as they are held rigidly in place by the jawbone. It will be easier to chew properly and you should be able to eat a greater variety of food. If they are used to replace upper dentures, you’ll notice food is tastier as your upper palate (which contains thousands of taste buds) will be uncovered. Implants help prevent neighboring natural teeth from moving out of position, and they don’t require these teeth to be modified in any way. Partial dentures can require neighboring teeth to be modified or ground down. The cost of dentures can vary according to where you live and the quality of dentures chosen. While it is possible to purchase cheap dentures, you’ll often find you get what you pay for. High quality restorations use materials and techniques that replicate the appearance of natural gum tissue and teeth. These materials tend to be stronger and longer-lasting and may even include a warranty. For one arch of teeth is typically between $300 and $500, or an average of $1,000 for a complete set of full upper and lower teeth. They usually come with a limited warranty, come in a pre-set size and don’t last as long as the higher quality options. Replacing one arch costs between $500 and $1,500, while a full set would be $1,000 to $3,000. These usually come with a 1-2 year warranty and have a somewhat personalized fit. Dentures using the best available materials cost $2,000 to $4,000 per plate or $4,000 to $8,000 or more for a full set. This includes several follow up visits to ensure a completely personalized, comfortable custom fit and a warranty for 5 to 10 years. Removable partial dentures start at $300 to $500, but average between $700 and $1,800. If you have a metal framework then you could end up paying $2,000 – $4,000 or more. They tend to be more expensive than dentures, but the costs depend on your dentist’s experience and popularity, your location, your dental health, the type of implant used, what diagnostic tests are required (x-rays, CT scan, etc.) and whether or not additional procedures such as a bone graft or sinus lift are required. Other factors to take into consideration include the number of teeth being replaced and the number of implants required as multiple missing teeth can be replaced with a bridge or denture supported by only 2-4 implants. It typically costs $1,000 to $3,000 to have a single tooth implant placed by a dentist. The implant crown will be extra and can cost anywhere from $500 to $3,000 depending on the materials used. The average cost of a single tooth implant is approximately $4,250 but your dentist will be able to give you a more accurate estimate after your initial examination. The cost of multiple implants can be anywhere from $3,500 to $30,000 or even more. Two can support a three or four tooth dental bridge, and the average cost of this treatment is approximately $8,500. If you wish to replace your upper and lower denture with implant supported dentures or with a fixed bridge, then you can expect to pay anywhere from $25,000 right up to $95,000, with costs averaging approximately $34,000. This is a considerable sum of money, but it is important to remember how many teeth will be replaced during this procedure and that it will require multiple implants. 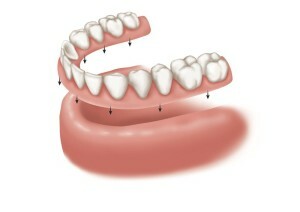 The All-on-4 technique is used to replace an upper or lower regular denture with a fixed denture that is supported using four implants. 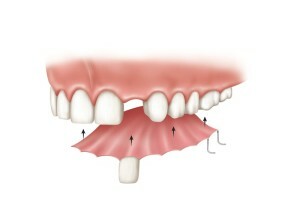 This technique is based on the way the implants are angled, as the two at the front of the mouth are placed at a 90° angle, while the two on either side are placed tilted backwards at a 45° angle in order to maximize the use of available bone to hold the denture securely in position. This is a specialized technique that requires additional training and planning. Dental implants are largely regarded as the gold standard for replacing missing teeth due to the way they replicate natural tooth roots which helps preserve the jawbone and gum tissue in addition to providing the best aesthetics. In the same vein, dentures can be tricky to wear, restrict your food choices and need to be replaced more frequently. However, there are many situations where dentures are the best option. Implants aren’t suitable for everybody. Dentures could be the answer if you are opposed to having oral surgery, grind or clench your teeth, can’t quit smoking or have a medical condition that significantly increases the risk of implant failure such as diabetes or any disease that compromises your immune system. They are also a great short-term option (several years) if you are currently unable to afford implants. Dentures may seem to be cheaper initially, but a recent study found that implants are a cost-effective option for replacing single teeth. For replacing multiple teeth, implants have higher initial costs but better improvements in oral health-related quality of life compared to other treatment options. What did you decide was the best option for you? Let us know in the comments why you’re leaning towards implants or dentures. I do have full upper dentures after years of having partial ones. First it was 2 front teeth and then it was 4 front teeth. The full denture is much more comfortable and is extremely stable when properly fitted, I have no problems eating apples or corn on the cob. I do not take my dentures out overnight and after 56 years of marriage my husband still has not seen me without teeth! It is a lot less hassle having the full denture rather than a partial and not ridiculously expensive. Now the bottom teeth are in trouble and it appears that I will have to go for the “4 in 1” procedure as there is not enough gum to keep a vacuum on the lower denture. I hope this helpful to someone.